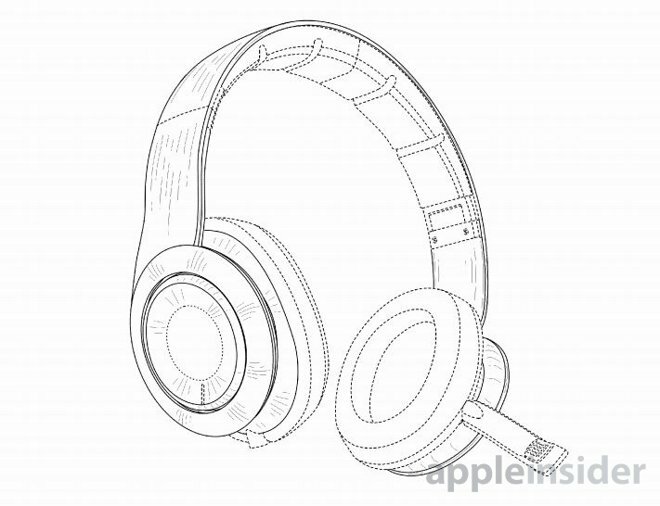 Apple on Tuesday won a U.S. design patent, discovered by AppleInsider, that could hint at the possibility of a Beats-branded gaming headset, potentially revealing a new microphone-equipped Beats product targeted at gamers. The patent consists solely of images, and credits Robert Brunner and Christopher Kuh as inventors. The two are designers with Ammunition, a studio that has created a wide range of Beats audio products, such as its Solo line of headphones. "Ammunition works in close partnership with Beats across product design, identity, and packaging to create an incredible experience for fans wherever they meet the product," one marketing blurb explains. The concept resembles other Beats headphones, but with the addition of a microphone jutting out from the left earpiece. Although phone-oriented headsets can typically get away with streamlined microphones, for instance hidden in a remote, an external microphone can be essential for gaming, especially when issuing voice commands. The patent was originally submitted to the U.S. Patent and Trademark Office on May 14, 2014 —just two weeks before Apple would announce its acquisition of Beats for $3 billion. It's not clear if Apple might actually be interested in manufacturing the headset. The company generally steers clear of gaming products, especially in the desktop and console worlds, where dedicated headsets are normally found. The Beats brand continues to exist as a separate entity however, and might afford Apple some flexibility.